Following Nancy Pelosi’s vow that her Congress would be the most ethical in history, she has tolerated some of the biggest scumbags in history, such as William Jefferson, who was caught red-handed with $90,000 of bribe money in his freezer, and his fellow House Ways and Means committee member (and chairman) Charles Rangel, who was caught equally red-handed massively cheating on his taxes. It should be pointed out that the House Ways and Means Committee writes the nation’s tax laws. It’s almost as egregious a violation as, say, the Secretary of the Treasury being a documented tax cheat. Oh yeah. Never mind. It is worth pointing out that if these guys had been Republicans, they would have been long, long gone. A private citizen was attempting to confront Charles Rangel a full year ago. And, of course, it was a well-known fact even as the Democrats were taking total power through a mainstream media campaign that falsely demonized the Republicans and falsely hyped the Democrats’ “change.” It’s a shame that the mainstream media and the Speaker of the House were indifferent to this kind of corruption from the guy who writes everybody else’s tax laws. Everybody should pay their “fair share” of taxes – unless they’re Democrats, that is. Particularly Democrats who write or enforce the nation’s tax laws and selectively punish whomever they want to punish for doing the same damn thing they do. Democrats are showing their true character. I saw a “Kerry-Edwards” window sticker on a car from Minnesota in my church’s parking lot. And I was utterly disgusted that somebody who actually thinks of himself or herself as a Christian supported such a putrefying pile of moral slime as John Edwards. And of course, as a backdrop to all this, New York is having an impossible time finding a Democrat who isn’t lower than whale turds to govern the state. Do you want the guy who rents prostitutes by the thousands, or do you want the guy who threatens beaten women to keep their mouths shut and not appear in court? Patterson says he won’t run for reelection, and presumably New York Democrats are going to “hope” for the “change” that the third time’s the charm. But let’s get back to Rangel. Rep. Charlie Rangel’s admonishment for violating House gift rules “is not good,” but his actions did not put the nation at risk in any material way, House Speaker Nancy Pelosi said Sunday. Pelosi said it is not her place to interfere in any investigations of the matter and said she would not get involved politically. I remember playing games with my kids. They understood the concept of winning, but they did not understand the concept of fair play. So they invariably kept changing the rules to benefit themselves at that particular moment of the game. Which is exactly what Nancy Pelosi, the complete moral idiot and chief Democrat ethicist, is doing now. With Charles Rangel, with reconciliation, with health care, with pretty much everything. Well, it must be fine then. It’s easy to be “the most ethical Congress in history” when you have such a personally vile sense of ethics. It’s this kind of moral reasoning that leads to the Louisiana Purchase and the Cornhusker Kickback. What is right and wrong is however we wish to define it at the moment; and we’ll change the rules again later when it fits our agenda to do so. 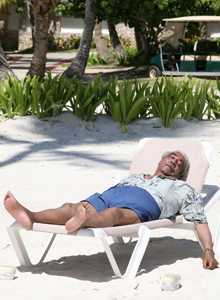 Of course, what the photograph depicts is Rangel on a foreign beach, enjoying the fruits of his tax fraud. Nancy Pelosi is protecting Rep. Charles Rangel, who failed to pay taxes on his Caribbean villa, among other miscues. But the ethically challenged congressional baron is endangering the Democrats’ control of Congress. When we think about the “ethically challenged congressional baron,” we should immediately connect him to the ethically challenged congressional queen. Throw the both out. Throw the whole lot of them out.